This post is, sort of, about a $10 plastic phone I bought on Amazon. It has a 1/8″ jack, and plugs into my laptop. It works the way headphones with a mic work – except, as my team can report, the sound quality is about right for a $10 piece of technology. Like most of you, I find the Internet deeply fascinating. Both the big idea of it, but also very specifically the stuff on it. It’s very easy to fall into a rabbit hole, to worm away your attention and time with something only tangentially related to what you’re allegedly focused on. Put another way: the Internet can be an enormous distraction – especially when it is also your primary way of doing work during the day, and being social during the work day. Slack especially is dangerous for me – I have to close the program altogether for stretches of my day in order to really focus on the task at hand. When I first joined the Happiness Team Leads at Automattic, I defaulted to voice one on ones for a few reasons; it created a more vulnerable (and thus more personal) space for both me and my teammate – communicating via text has some advantages, but it also allows for self-editing and thinking-better-of-it effects that voice lacks. You only have to see “Simon is typing…” … [pause] … “Simon is typing…” … [pause] … “OK.” once or twice before it becomes obvious you’re only getting part of the message. An unintended side effect of voice one on ones is that we tend to cover a lot more ground – when communicating vocally, you’re able to say a lot more, and really understand more quickly – especially with folks you’ve gotten to know well – over text, which in my experience takes more questioning, more back-and-forth to really be certain you’re on the same page. With 30-minute blocks, being able to get more communication into each one is quite nice. One thing I have grown to appreciate about voice one on ones is that they help me to focus – and not only that, I am much more aware of when I am failing to focus. My first big distraction was Slack – I found that during one on ones I’d be scanning through channels, not paying full attention (or respecting the time of) the person I was talking with. So I started closing Slack immediately upon the start of each one on one. That helped. I got a little better. I was a little more focused, a little more present. After that it became just the Internet at large – I’d sort of open Facebook idly while waiting for the other person to open Skype. I’d check my tweets. I was aware of it. I tried to stay focused. I was mostly present! I was mostly 100% in those conversations. But not always. And the lack of focus was killing me. So, I figured it was time to start trying things. I tried locking down my monitor, requiring a password to log back on. That was more trouble than it was worth, since many times during one on ones we shoot links or screenshots back and forth, and fumbling to unlock back to my desktop was a hassle. Then I bought the phone. It was $10, I figured it was a small investment, especially if it helped me to become a better, more focused servant to the team. Shockingly, it’s made a huge difference. There are two things happening, I think. First, it’s a thing. I have to dedicate one hand to using it, to holding up to my face. Unlike headphones with a mic, this only leaves one hand free – which is enough to right click and copy-paste, but not enough to type easily. Secondly, I’m in my thirties – I grew up in a time before cell phones and largely before easy and fast internet access. I came up using phones like this, big chunky corded pieces of molded plastic. I called my first girlfriend on a phone like this. 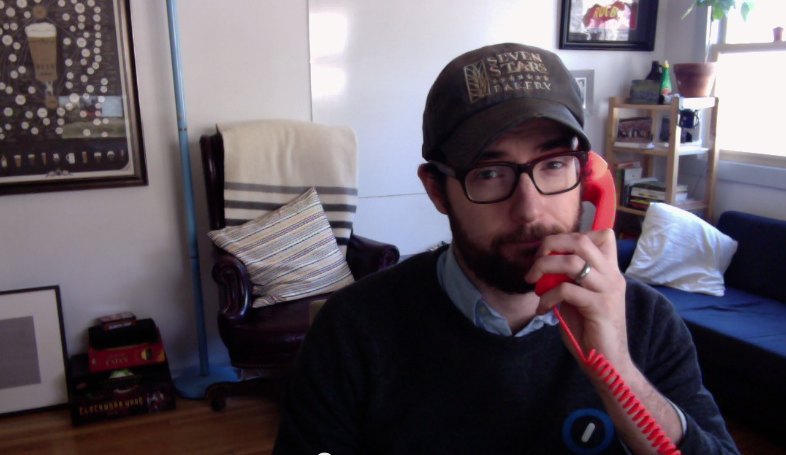 The only time in my life I’ve ever made calls with headphones is since I’ve become an Automattician. Taking my communication medium back in time, to the original phone of my youth, was a real psychological game changer for me. It’s easier to focus, it’s easier to get comfortable. It’s weird. But part of working remotely is getting weird. The moral of this story is not Go Buy A Plastic Phone. The moral of this story is this: be cognizant of yourself, and where you could be doing better, even a little better. When you find yourself irritated or anxious about your work or performance or behavior, don’t push that away – sit with it for a moment, and ask what you could do that would make that stimulus even a tiny bit better? Maybe it’s a number pad, because entering data with the top row numbers is a hassle and leads to lots of errors. Maybe it’s always wearing sneakers when you work so you have one less piece of friction between you and going for a walk. Maybe it’s a big obnoxious plastic phone. Whatever helps you get a little better, give it a try. By popular demand, here’s an Amazon Affiliate Link to the phone. Don’t forget the rotary dial app!